Algerians climbed on the iconic Marianne statue in downtown Paris as the protest against Bouteflika's intention to seeka another term in office. 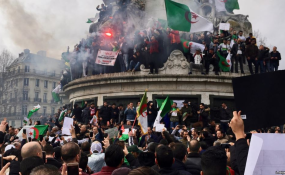 France has remained conspicuously silent as Abdelaziz Bouteflika, a veteran of Algeria's independence struggle, stares down a wave of angry protests opposing his bid for a fifth term as president. And with good reason, say some experts. While President Emmanuel Macron was quick to take a position on the political crisis in Venezuela - where the masses are seeking to topple Nicolas Maduro - he's yet to weigh in on events across the Mediterranean in France's former colony, where huge crowds are similarly hoping to topple an authoritarian leader. William Jordan, former deputy chief of mission at the US Embassy in Algiers, says France has little choice but to walk on eggshells where Algeria is concerned. "This is a key consideration stemming from its colonial history. Atoning for French sins, Macron is conscious of measuring his words carefully," Jordan says. "He knows that anything France says or does is going to be seized on in Algeria for whatever political agenda they may be pushing. The question of perceived French interference in Algeria is a big club that anyone on either side can use. "A bedrock of French policy is that they prefer stability and predictability over anything else," Jordan adds. "The French government simply doesn't want to see a change in the status quo and to launch into the unknown." Another fear is that insecurity in Algeria could spur waves of people to flee to France, says French historian Tramor Quemeneur, who specialises in the Algerian war of independence. "Given the countries have such close social relations, we could see a flood of Algerians coming to France, where a lot of Algerians live already," he says. "The Macron government does not want to see a lot of Algerian exiles in France." Macron knows that anything France says or does is going to be seized on in Algeria for whatever political agenda they may be pushing. The question of perceived French interference in Algeria is a big club that anyone on either side can use. There's also the question of the defence and security links that underpin the Franco-Algerian relationship. Algeria is the largest country in Africa, and it holds the key to the security of the north-west. While France's own problems with social movements - ie the gilets jaunes, or Yellow Vests - make it hard for Paris to adopt an official position (France has to be seen to be supporting democracy), Quemeneur says the real reason for Macron's silence is to do with security and fighting terrorism. "France has a close relationship with the Algerian regime, and the Algerian regime plays an important role in the Maghreb and in all of North Africa - including the Sahel," he says. "Algeria is crucial to the Sahel's defence and security, so a big political change could pose problems for France as well - and for the fight against jihad," he adds, noting France's engagement in combatting Islamist militants in the Sahel. Jordan goes a step further, saying it's no coincidence that Bouteflika is seeing an uprising by people fed up with political and economic stagnation at the same time as Macron is being challenged, for similar reasons, by the Yellow Vests. "People in Algeria see similar problems playing out in France, and there are some who may be drawing a certain inspiration. Algerians pay attention to events in France because of their longstanding history," Jordan says. Algeria also has significant oil and gas interests, and offers a lucrative market to many French businesses.